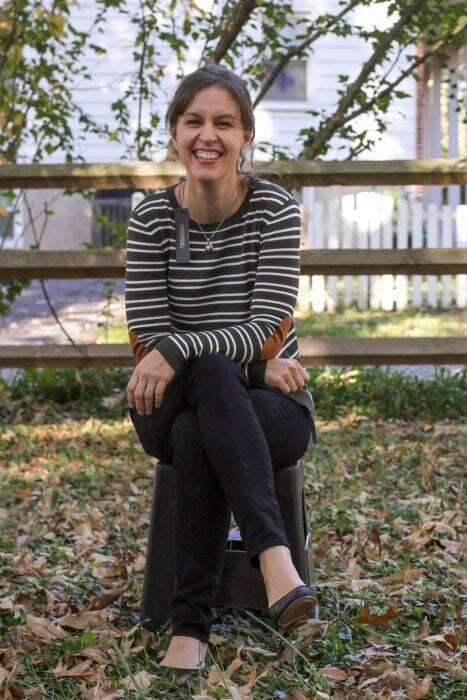 I’m currently giving Stitch Fix a try, using their “The cheaper, the better” option as a price point.And every month, I’m un-professionally modeling what Stitch Fix sends me. Stitch Fix has not sponsored these posts, and I’m not working with them. Links are the same referral links every Stitch Fix customer gets. My second box from Stitch Fix arrived this week! Getting a box of clothes in the mail IS pretty enjoyable, I have to say. So fun to see what shows up! First up is this gray top ($38). So, I’m gonna keep this one. This next top ($34) is pretty cute, and I like the v-neck. But, I feel like it’s just a little too wide in the torso area…I think I could have gone down a size. Also, it’s a 3/4 sleeve shirt, and while I love the way those look, I find them to be rather impractical. The weather is almost always too hot or too cold for those sleeves, and it’s super annoying to try to put a jacket or sweater on over 3/4 sleeves. So, this one is going back. This olive striped sweater ($54) was comfy, and a fairly good fit. The arms were a little tight, though. And I’m not sure about the elbow patches. Plus, I really, really do not think I look that good in crew necks. V-necks, boat necks, scoop necks, yes. Crew necks, not so much. So, I’m sending this back. My last top is a Stitch Fix exclusive ($54). I like the neckline of this top, but that is it. I feel like the yoke and the body of the shirt don’t match, and I’m not a fan of the patterns to begin with. The reactions of my family members were similarly unenthusiastic. Tell me how you really feel, guys! Spoiler alert: I am not keeping this one. Lastly, I got a pair of black skinny jeans ($78). As you may recall, last month I kept a pair of similarly priced jeggings, and I have to say, I can definitely see a big difference between them and my cheaper skinny jeans/jeggings. I can’t tell about the longevity yet, of course (which will be very relevant in determining whether the higher price is worth it), but the fabric on these more expensive jeans is a lot thicker and also much more stretchy. Like, when I sit down in them, they don’t pull at the waist, and it’s also way easier to bend my knees. So, the higher price point is giving me a more comfortable wearing experience, which is worth something even aside from the longevity possibilities, and I find myself reaching for the comfy, stretchy, more expensive jeans instead of my cheaper jeans. I didn’t think I’d ever be a person who pays more than $25-$30 for a pair of jeans, but boy, I sure do find these more expensive jeans to be a whole different experience. So. I’m definitely keeping the gray top, and, um, I think I’m going to keep the black jeans too. Then I’ll have a stretchy blue pair and a stretchy black pair, which means I won’t have to wear my less-fabulous jeans all that often. The total for the whole fix this time if I bought all five pieces would have been $173 ($34.70 per item), which is definitely less than my last fix. If you’d like to try Stitch Fix, here’s my referral link. I think maybe you get a complimentary styling fee or something like that (let me know!). What do you think of this fix? Would you have made the same decisions I did? Thanks to Joshua for snapping photos of me for this post. I think that was a pretty good match for you, style-wise, yes? That means your stylist is figuring out your preferences. Thumbs up. The thing that I always wonder about stretchy, comfy jeans is will they stretch out of shape an hour into the day and leave me with the saggy bottom and yanking them up the rest of the day? I assume the more expensive jeans don’t do this. As I’m currently in the “maternity jeans aren’t really necessary but regular jeans aren’t happening yet” post-partum phase, I don’t need a definitive answer on that right now. Fashion is not my watchword at the moment. Yes! These do not sag, which is fantastic. Like, even after I sit down and then stand up, the jeans are still where they’re supposed to be, with no adjusting necessary. I keep being surprised by that! Postpartum is totally not the time to obsess about fashion. I was always in stretchy pants and survival mode! Hi, I have never had a skinny stretch pants that I didn’t have to adjust! What is the brand name of those jeans? These ones are a Stitch Fix exclusive, I think…the brand is Just Black. The brand is not exclusive to Stitch Fix, though the style might be. They are manufactured in Los Angeles, so American-made. Looking around the internet, you did pay a premium price for them. BUT–that might be worth it to you for the convenience. 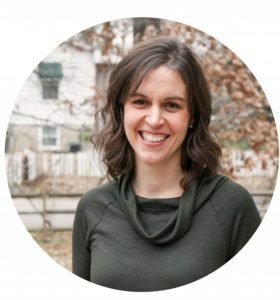 You’re a busy lady–kids, homeschooling, full-time blogger. Everyone has to make choices. Ohhh, maybe that’s what the exclusive thing meant. This is good news, though, because it means I can go shop for them on my own. Yay! Don’t use stitch fix. They up price their clothes and quality is not that good for how much they charge. Use to work at the warehouse and they put sent back clothes on new fixes. What else should they do with returned clothes? Throw them away? Why? That’s what I was wondering. I always assume that companies that accept returns will ship those items out to other customers. Brick and mortar stores don’t throw away clothes that people tried on at the store, you know? I thought the v-neck looked really cute on you. But I too have never loved the 3/4 sleeve trend. I always feel awkward in those shirts. I’m not a big fan of 3/4 sleeves either. I feel like the sleeves just end in the middle of nowhere @_@ However, many people know how to mix and match their outfits, so 3/4 sleeves can totally look great with the right skirt/pants and blazers! I think maybe the problem is that I live in an area without oodles of in-between season days. There’s mostly short sleeve/tank top weather and then long sleeve/sweatshirt weather. Long sleeve weather doesn’t exist for me because I hate wearing my sleeves down to my wrists. Over my hands? Yes. 3/4 length? Yes. Wrist length? Ugh..must push them up! Elbow length? Terrible because it tickles the inside of my elbows. Lol. So, in very cold weather I wear 3/4 length and a coat. It helps that I am naturally warmer than average. I’m another fan of 3/4 sleeves but I live in the south where winters are mild. There are really cold days but not for weeks on end. If it is cold and I want to wear a 3/4 sleeve, a camisole underneath the top seems keeps my temp comfy. I also have long arms so I’d rather have 3/4 length sleeves than long sleeves that are a bit short. I think the prices are a bit high. If I love something and the quality is great I could see me getting an item or two but it would have to be special. Shopping sales I can usually find plenty of tops I like in the $12-$20 range. Love Ross, Cato, and a good sale at Belk. Hi Kristen, interestingly enough, that expensive shirt no-one likes is the only one I do like I agree with your takes on the others but I think that one has a nice neckline and sleeve, and flows well on your body. Glad you’re enjoying your stretchy jeans! I really liked that shirt, too! Maybe it’s not as cute in person. I think it’s one of the best you posted. I do love the gray one also! If you can get a pair of jeans you love, it’s worth paying more. If you are like me, you will wear them until they fall apart. I agree. I thought that shirt was not only cute but a departure from her normal style. For me a clothing subscription is all about getting things I’d never try otherwise. It’s tough to do if the rest of the family thinks I look weird. Lol! Another vote for the duel patterned grey shirt!! I thought the cut looked great on you. And it is float ad dressy. The two patterns together seem to go together to me (and I don’t like mixing patterns). Maybe it isn’t as cute in person. A side shot would have been good to show how it looked like a maternity shirt. But from the front it is super cute. I really liked the 2 pattern top. It was my favorite of all the items. Yes, better quality is worth the price. I liked it on you too! I’d keep the jeans too. Cute! The last shirt was my favorite as well!! I’m glad you’re returning that two-print top because I wasn’t going to read your blog anymore if you kept it. JK. Despite the price, those jeans looked like they for really well! And I loved that first sweatshirt type shirt! Super cute and versatile! I’m interested to see how much better their picks get for you. Ha, yes! They’re enjoying seeing me model the clothes, and they are not at all shy about expressing horror over the ones they don’t like. That striped, elbows patched sweater I’m not into and I agree.. that last shirt can go back.. just looks odd…. If I could find a pair of jeans that fit my odd zones… and I was always comfortable in.. it would be worth every penny! I really like the two print shirt, think it looks nice on you! I not a fan of the stripped top, with the elbow patches, never was a fan of those patches. Gray one is just ok. I kind of like the 3/4 sleeves, its just not my style (those stripes). Always nice to have a great pair of jeans! I like what you chose. You’ll get a lot of use out of those black jeans. I didn’t love that short sleeve one, but I like the idea of a flowy, feminine top. I think that your stylist is doing pretty good job finding your style. I agree with what you picked-you know what looks good on you! I like the style of the short sleeved shirt on you, but not the pattern… it seems a bit dressier than the other items. I Those skinny jeans look fantastic! Total cost is actually $258 with an average cost per item of $51.60. Well, actually, you get a discount if you buy all five pieces. So, the price per item goes down quite a bit. Unfortunately, so far I haven’t liked all five items in my fixes! I didn’t catch on whether these are new or used clothes. Either way I think they are too expensive for a frugal blog. These ones are new (ThredUp is used.) 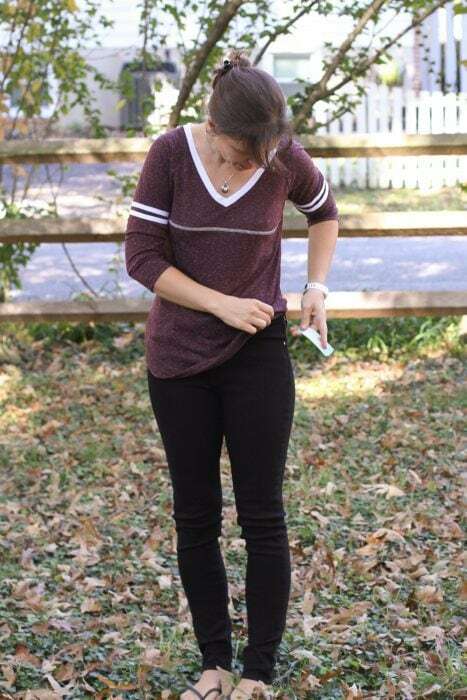 They’re definitely a walk on the expensive side for me, but the whole reason I’m doing a series of trying Stitch Fix is that I’ve never seen a frugal person review their services before. So, I’m giving it a try for you all so you can decide whether it’s worth it or not. I agree ….might be something not quite keeping with the theme of a frugal blog for most people so I’m not sure I would put it on here. I feel the price points are high and one could just as well grab a bunch of items from Marshalls and TJmaxx to try on at home and return whatever doesn’t fit. I just feel those same jeans might be 30ish at the discount stores I mentioned. Did you google the pair of jeans to see where they should land price wise? Or does stitch fix have their own brands? This pair of jeans is a Stitch Fix exclusive, but the pair I kept last month is an outside brand, and they were the same price elsewhere when I googled. I think it’s in keeping with the spirit of this blog. Which is frugal, but willing to pay for quality when it’s worth it. I normally buy used or clearance, but I think it’s very worthwhile to pay more for than I usually would for a piece that is perfect and that will last. Better to pay more for one really good piece than to pay less for five so-so ones…. It’s not frugal to buy things that aren’t great, that won’t last and that you won’t wear because you don’t like them enough. And Stitch Fix can help you find that perfect piece, so I think it’s definitely worth a review, even on a frugal blog. I totally agree with Anne. These are actually pretty frugal prices for new things, especially when you consider that a stylist picked them out, you didn’t have to go dig through the racks at a place like TJ Maxx or Marshalls. (Nothing against that, but I don’t always have the time.) Plus, you might be sent something that your eye wouldn’t usually pick out and you might discover a new style or color that looks great on you and that is totally worth it! Not to mention it is a fun treat. Even the most frugal person can’t help but like that idea. That said, once I found a brand of jeans I liked, I would totally check out other discount places to find more a little bit cheaper. I’m glad you are sharing this, Kristen, please continue to show us what you get! I love that you’re reviewing stitch fix on your blog! I have found stitch fix to be a more frugal option than shopping on my own because (1) I love the pieces they send me and consequently wear them for years and (2) the quality of clothing is much higher than almost every other place I shop. Frugal isn’t the same as cheap, and for some I think this service might useful and financially prudent. I’m glad to see someone who seeks to be frugal giving Stitch-fix an honest and fair review! I agree, I was reluctant to try stitch fix but I have found a great stylist and consistent quality. I loved to shop but often bought this because they were a great bargain price wise but actually were not flattering. I actually spend less and live my clothes. I get a box every two months and although I don’t always keep each piece I find the ones I do are my go to clothes. For me this has been a frugal move and a fashionable one. I meant that this is not frugal. How long are you doing this for? Yay Kristen for taking one for the team! I’m enjoying your experiment; thanks for sharing your experience. It’s free for me to watch you do the research and what could be more frugal than that? Hooray! You’re really good at modeling! Very natural and comfortable in your own skin. I am definitely a thrift store clothing shopper – anything over $5 is a splurge for me I just cannot see myself ever doing something like StitchFix. It helps that I am not very interested in fashion and wear pretty average (therefore available) sizes. That is a good point; being an easy-to-fit size makes it a lot easier to use things like ThredUp or thrift stores. what brand are the black jeans? I gave SF two tries and sent everything back. The clothing is cheap quality. You can find those $78 jeans in Forever 21 or H&M for less than $50. EVERYTHING is over-priced. You have to be fashion-clueless to keep these matronly clothes. That seems a little aggressive. While it’s true that you can probably find jeans that *look* similar in Forever 21 or H&M, I can almost guarantee you that they will not wear the same way. What brand are those jeans? I would love just one quality pair! I’ve tried Stitch Fix a couple of times. The quality varies considerably. I ended up purchasing a couple of pieces that were considerably more than I would normally pay, but they’ve proven to be high quality, they expanded my style (I would never have thought to try them on) and I wear them all the time. So I think they were really worth the price. Also, why the attack on her personal style? I think she looks great, but even if you don’t there’s no need to be mean about it. She may be commenting on the boxes she bought…not sure. And really no one here has worn any SF clothing long enough to comment on the quality. For all we know it is a company that sells cheap quality clothing. I guess Kristin will have to keep us updated as to how the jeans wear. Wow! Way to be mean-spirited. Kristen, please disregard her rude comment! 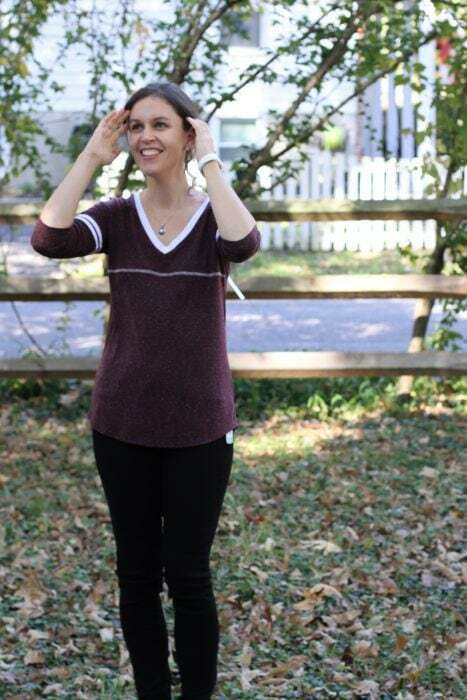 I love reading your StitchFix reviews so far! Thanks for sharing them. You’re right, I’ve never seen a frugal blog review them and I think it falls in line perfectly with your views, that quality and (sometimes) convenience is worth a little extra. I’m interested to hear how they all hold up after lots of wear. Also, I would have kept the olive swearer, it looked great on you! I have to laugh at your families’ responses! Pure honesty there. When I go clothes shopping, I am thrilled to find something that fits well, that sometimes I spend a bit more than I think I should. Jeans that fit…definitely worth it! And leather shoes…definitely worth is as well in my book! I paid $100 for my leather knee-high cognac boots, and still don’t regret it. That was a lot of money for me, but I didn’t want to pay $20+ for boots that would end up with holes in the toes after one winter. Also, the cheap suede boots let your feet get wet in the rain/snow and aren’t as warm. This winter or next I’ll break even on comparative cost, but I like not having to replace them every year. I also have found that vinyl shoes make my feet sweat horribly, which is miserable when you have to walk around with damp, smelly feet all day! Kristen – I agree with Emily that the Stitch Fix reviews fall in line with your views and therefore definitely have a place on your blog. I like reading these posts, even if it is a service I don’t plan on trying anytime soon. I love this Stitch Fix series!!! I am frugal, but tend to spend a bit more on quality clothes because I have the clothes forever. So, I am super interested in how this experiment goes for you. I think it is perfectly in line with all things Frugal Girl. I also love the pieces you’re keeping. The grey one is super cute. I think that the shape/idea of the last one has potential, but the actual patterns just don’t quite work. Do they ever send accessories? Yes, they do! I just haven’t gotten any yet. Maybe in the future they’ll send me some. 3/4 sleeves are my favorite!!! I also loved that color. But that gray was definitely a keeper – very cute! I’ve watched a lot of Stitch Fix unboxings/try-ons on YouTube, and I have to say that I don’t really see anyone getting “quality” clothes for the prices they are asking. Also, it is rare that I’ve seen someone who gets a box where they truly love all five pieces, and often I’ve seen people who will keep one thing that they are “meh” about because they don’t want to lose their $20. I think it is a gamble to subscribe to something like this, especially if you are on a tighter budget. Even with your “the cheaper the better” you’re still getting tops that are $40 and $50. That still seems expensive to me. The average person can go into the mall and spend less per top at many stores, even if they are paying full price with no coupons. But the fact is, most stores have coupons and sales so why buy something for full price? I do really like the gray top on you! It seems to fit you well and fits your style. I like the 3/4 top on you also, but understand about weather! That grey sweater is so cute! The maroon top reminds me too much of a certain college’s colors here in TX so I’m not a fan. My hubs also hates “fake maternity” tops, as he calls them so I’ve culled those from my wardrobe over the years. Those jeans are cute! I hope they last $78 isn’t terrible. I’m still used to sale items or Goodwill, so Stitch Fix prices are not for me, but my wardrobe is pretty stacked as it is so I’m not in need of new items. The “correct” color for that maroon sweater is orange and white. Hook ’em horns! This cracked me up! The rival makes its way on to a fashion blog. The competition is fierce no matter where it pops up! In true Texas fashion. One of the great things about my home state! I am really enjoying this Stitch Fix series. I think that it is great that you are trying this service and buying yourself some cute, versatile clothes which you really like. It is frugal to buy clothing which is well-made, fits well, and flattering because these are the clothes you will wear all the time, be comfortable in, and look/feel great in. Thanks for taking us all along on the ride! You picked the best ones! Thanks for doing this!! I’d Love to do stitch fix but at this point it’s out of my budget. But your reviews and showings make me wanna try it when we get a little further along in our savings. I wear jeans and a t-shirt all. The. Time. I’d love to see what someone else picks for me to gently nudge me out of my “mom clothes” rut. I am a devoted Goodwill shopper (as in 95% of my clothes are from there, lol), but I probably would have kept the pants too. And possibly the top. I like the color and sweater look also. Modest and well fitting shirts are the hardest for me to find, but my “endowment” is rather generous shall we say . The burgundy shirt is too sports jersey-ish for my tastes. The olive shirt’s stripes are too small/close together to me; though I love the olive color AND the elbow patches. The last shirt is just……awkward . Mixing patterns is a big no-no for me. I love the two-patterned shirt! Anything with mixed fabrics or mixed patterns is a favorite of mine. But, to each their own. I’ve tried Stitch Fix several times, and they just never really hit the mark with me. The clothes were cute and most of it good quality, but just not something I wanted to spend my money on. Still, I enjoy seeing what others get. I just wanted to say that it’s your blog and you can put anything you want on it. Frugal means different things to different people, or even to the same person at a different time or different aspects of life. To me, at this point of my life, it means buying less of high quality items that will get a lot of use (clothes or otherwise). I try to get the best deals, but it would never be Goodwill or Walmart prices. Although, I’ve definitely went through times when I could only afford the cheapest options, and that worked out just fine at the time. Great keeps. I love scoop necks too. I really like the idea of the elbow patches but not on a “dressier” shirt like that. I have some on a casual button down of mine and love it! As for the last top (the exclusive), clearly pictures lie because I think you look amazing in it and love it! Mind you, I can’t see the difference in colours so it might just be the picture. I love the v-neck shirt but can agree about the 3/4 sleeve. I prefer a full length sleeve that I can push up on my forearms or leave down as the temperature dictates. Unfortunately, I have long limbs so finding a long sleeve shirt with sleeves long enough for me is problematic. This service wouldn’t be for me though. I tend to shop places like Ross Dress for Less and Goodwill where I often find quality brands like Calvin Klein for much less than the prices of Stitch Fix. And I routinely try on things that are to the left or right of my normal go-to choices so I’ve no need for a stylist to help me expand on my wardrobe. But I can see where some people might find such a service fun or useful. I enjoy your reviews of many things. I may not try them all but they add to my knowledge. I wouldn’t use SF because I am so hard to fit,regular torso but short arms & legs. I also in a wheelchair so a lot of things just don’t look good. Ido feel good quality trumps price but I keep my clothes for years. I do buy sales when possible. As a Marshalls/Ross/TJMaxx shopper I’m finding these items to be slightly overpriced. I tend to buy made in the USA and higher end designer clothing for less than that. Its a bit of work to pick through the flotsam at said stores, but worth it in the long run. Then again I only shop twice a year and very selectively. I’d find a monthly box of clothing far too excessive for my frugal ways. It’s may still not be your thing, but you do not have to sign up for monthly boxes. You can just get one whenever you want and not subscribe. Unless they’re changed it, you can schedule a fix whenever it fits your schedule. Once a quarter, month, or just as needed. I also thought the black jeans and gray top were the best picks from the box. I DID like striped top (the crew neck was fine! ), except for the elbow patches (blech!). The 3/4 sleeve top wasn’t terrible, but I didn’t like it much. The two-patterned thing – uh, NO. I think we have the same taste – LOL! Everyone’s comments on the patterned shirt. LOL!! I’m kinda getting curious about what they would send my way. I mean, quality comfy jeans without leaving the house?? That’s a pretty big plus right there. The cut and colors of the the blue patterned shirt look fabulous on you. But I agree that the patterns don’t really go together. If it had been one or the other it would have been excellent. The pants sound awesome! I’d like to try some similar ones eventually. I’m loving your Stitch Fix series. I think this was definitely a better box. My favorites by far were the gray top and the black jeans so I would’ve kept those as well. I totally agree about the pricier jeans feeling and wearing better. The ones you got this month look great on you! I’m now looking forward to your next box. 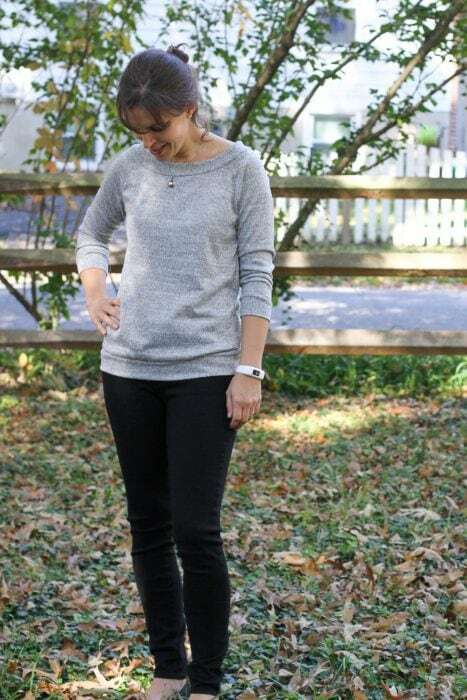 I DO love that first gray sweater — the perfect cross between a sweatshirt and a nicer sweater — looks comfy but also stylish — the sweet spot of fashion. And silvery gray is just so lovely and seems like a good color for you. I thought the other things (okay, maybe not the maternity shirt were fine but the pants and grey top were perfecto. Agree with someone up-thread that the patterned number was adorable from the yoke up. So, it sounds worth it! This is a fun series! Another vote for the hated shirt – I thought it looked great on you and I fully expected you to say it was your favorite thing in the batch! I did like the grey sweater too! I really like your picks, like you there is always 1 piece that I could do without but keep it anyway. I really like the jeans. I really enjoy these posts! I agreed with your picks, too. I shop used 95% of the time except for slacks, which are hard to find that fit, even new. Stitch Fix wouldn’t work for me but it’s a lot of fun seeing someone else use it. I tried it starting last month. I used the cheaper the better as I am constantly flexing and weight and style. So the first box if I bought all items was almost $400.00! The Liverpool jeaggings were amazing on my rear everywhere else not so much. They sent me a jacket… to tight in the arms and the tops not doing it for me so I sent everything back. So…. I did as they suggested wrote a note explaining my body, how things fit it so on and so forth, and updated my profile, went on pinterest to try to make sure I was helping the. Like my wants and needs better. I also explained why each item didn’t work for me. I just got box 2! Got the same jeaggings only in black this time. If they are the exact same size and everything as the last time how with the result be different? I had adjusted my profile to no jackets do to the arms. Well low and behold in my box a jacket (that once again didn’t and fit my arms. Then 3 shirts of which only one fit a crossed my chest. Needless to say I sent everything back again. In my case ended up not working out so well. I canceled the shipments. I like the idea but not when it’s seems pointless because I put extra time in to it to make it beneficial and enjoyable and in the end felt disappointed and fat. I can do that on my own. I had never heard of stitch fix until your series. I am surprised how much I love seeing what you got and what you like. You really have me considering looking into good quality jeans. Honestly, I do not even know where I would begin to look for good quality jeans? I normally have to try on about 100 things to find one that fits good/feels good/looks good. As someone mentioned in a comment in a different post I think…….it is hard when you are a (49 year old here) Grama trying not to look redicules! I don’t want to dress to young but do not want to dress like my mom either! Plus I am hard to fit for jeans and I still like the boot cut. Skinny jeans are not for me! I hate to say I have a closet full of clearance and thrifted clothes and I wear the same probably 10% of them over and over. So really, if I were to take the time and shop without looking at price tags first ( to a certain degree) and only get things I love that fit and look great and keep a smaller wardrobe then I know for a fact it would not cost me anymore and how great would it be to actually wear everything in my closet! I love the gray shirt and black jeans but thought all the others also look cute in you. The grey top you’re keeping looks darling on you. I’m a fan in general of elbow patches so probably would have kept that shirt. The jeans are terrific. So flattering. Speaking of jeans, are you comfortable with sharing the name of the pricey jeans, Jules? I can guess at a few of the brands that it could be. Finally, I knew someone once who years ago would take her son clothes shopping with her so that he could see what she was trying on. If he gave it the thumbs up she knew that an item was a keeper. He was ruthlessly honest but spot on with what looked good on her. Lots of opinions. 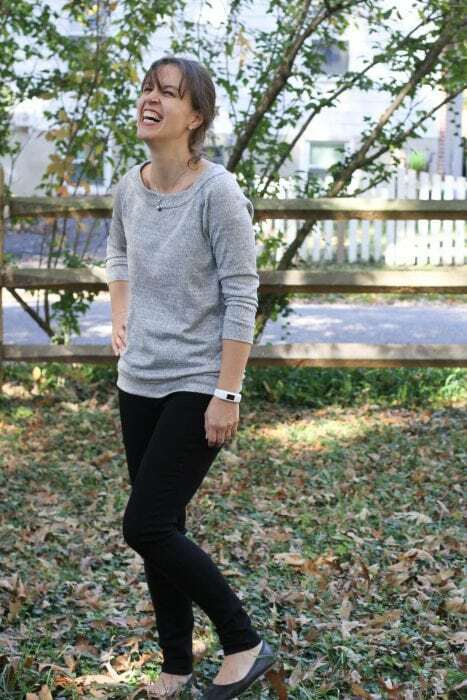 . . Love the Stitch Fix posts – any day that clothes come in the mail that I don’t have to try on in the store is a good day, lol. The gray definitely suits you, and is cute – love the neckline on it. Funny thing about elbow patches, I like the look but don’t like wearing them – they feel weird. Also think that shirt would have been better with a scoop or v-neck. Cracked up laughing at the family comments about the gray/black shirt – I’m not one to mind mixing prints, but if the feeling is that strong, def not one to keep! Right? I don’t exactly want to wear something that my family actively hates. Luckily, I didn’t love the shirt either, so we were all of one mind. I’m loving the Stitch Fix review as well! Some of my friends use it but they are “shoppers” and spend a lot more money on clothes then I like to, so it’s nice to see someone a little more financially conscientious trying the service out! I do wish I could request specific pieces I’ve seen people purchase from them — I’d get the gray sweater and would love to try the jeans! I’ve also been amused at certain commenters who seem to think that because you’re frugal, you can’t have anything nice, shouldn’t enjoy luxuries or that frugality is a contest. There are all sorts of levels of being frugal based on lifestyle and income. I keep a minimalist closet, however I buy expensive shampoo b/c it makes my hair look nice, it’s a luxury I enjoy and since I only wash my hair every other day, I make it last forever. Likewise, my family goes out to eat very rarely, we don’t have cable t.v, and we drive older cars but we love to ski (a mind-boggling expensive sport). Skiing is one of our great passions, it’s an activity we do as a family and saving in other areas of our life allows us to enjoy the experience and create amazing memories. I really enjoy this series. Thanks for continuing it! I also do not look good in crew necks…not exactly sure why, but glad I’m not the only one. I think the gray shirt looks the best on you, although I think the last shirt looks great also. It must look different in person and/or from the side. From the pic it looks like it fits you quite well, not like there’s any extra “maternity-type” room there. Until this second post on this, I thought Stitch Fix was secondhand clothes, and thought the prices were a bit high…but not at all high for new clothes. For the couple people who found these prices not frugal, I wonder if they live in lower COLA areas of the country? Where I live, these prices are the same as you’d find in TJMaxx. We don’t have a Ross, etc, as I did when I lived in a smaller town area. Following this post, I’m considering Stitch Fix. (The only secondhand store near me is a Salvation Army that is cited nearly every week for bed bugs…not going in there, so a TJMaxx-type is the cheapest option around). They sent you some really great choices! I’ve wanted to do this for a bit, but I just signed up with your referral! Can you share the brand of the sweater/sweatshirt you are keeping? I love it for the same reasons you do! Let’s see…that one is called Nine Britton Paulsen Knit Pullover. I’m enjoying your fashion show, am appalled by the prices and wonder why they’re not sending you a wider range of styles or choices. Did you request four shirts and one pair of pants each month? No dressy stuff? Is that part of the choices? I’m totally unfamiliar with this service, but thanks for sharing! I requested semi-casual stuff, since I don’t work in an office or anything. My church is pretty casual too, so I just don’t have a lot of call for dressing up. I agree with ur choices. The pants are great. Ive been using Stitch Fix for a couple years and I love it! It took them about 4 fixes before they started to get my style. I also save looks I love on Pinterest and they have check to see what I add every month. If u want to be very specific about stuff, just add it to ur note. Want ALL tops or ALL pants. They do it. Some items are overpriced, but it beats taking time to shop. I get tons of compliments! Ironically, I think the shirt you hate looks the best on you! It’s hard to tell the colors from the photo, but the patterns and shape are very flattering. It’s funny how different clothes and designs appeal to different people. I think the grey top looks good on you and looks very useful, I didn’t like the v-neck top on you; the arm stripe made it a bit reminiscent of high school sports team top for me. I thought yhe olive stripe top was bland and didn’t do that much for you but I thought the two- pattern top looked sensational on you; different, dressy but you have to wear what YOU feel right in and if your family opposes it that much you won’t enjoy wearing it. The jeans look really practical and will last you a few years I think. There is a time to be really frugal and I have bought many items from op-shops that have lasted me for years and I can’t afford designer clothing but I am surprised by the comments regarding clothing prices, you would rarely find really nice new tops for less where I live unless on sale online and I guess I think too if you MADE a top like that would you be prepared to sell it for less than you paid. Corporations sometimes mark up clothes 90% while the people who made them earn a daily pittance, I think living frugally shouldn’t result in someone else living in poverty. Often in the Western culture we want dirt cheap products and high wages for all but life doesn’t work like that so we have China the world’s factory using pretty much slave labour so we can live a privileged life. It’s also interesting to note some of the product recalls that have been made of cheap clothing containing carcinogenic dyes. I can’t always find clothes ethically made but for me living frugally is more about consuming less, wasting less, and spending thoughtfully with a plan instead of impulse buys, I have reduced my wardrobe enormously and have far more outfit choices just by learning to build a working wardrobe and refusing to buy anything ‘because the price is so good” it has to be something I know I will want to wear until it starts looking to tatty and for me sometimes that means spending more. I was at my friends when she received a box and wow, I was shocked at how much the pieces were. Especially since a cheap pair of costume jewelry was 28.00. I don’t think I could spend so much per piece. I’m a huge bargain shopper. The shirt I’m wearing was 8.00 at Old Navy and my shorts from Kohls were about 20.00. Def striped shirt, maroon shirt and black jeans. No gray sweater and maternity shirt. Do not like the gray one you picked, it hits you wrong at the bottom and makes your chest look small. Marinell, you are certainly entitled to your opinion, but the words you chose perhaps reflect you more than Kristen. Keep reading along here and Kristen’s consistently kind ways might just be a perfect tutorial. So much to learn here at Chez FG! I completely agreed with your choices. I would have had the same thought process with the price of the pants but they look great on you, you made the right decision. Looking at your review reminded me to add in my notes to stylist , no horizontal stripes or 3/4 sleeves. Thank you for this review, it was very helpful! I agree with you on the elbow patches. I think it would have been cute IF the color of patch had been charcoal or white. The brown was ugly! My husband bought me a sewing machine for Christmas so I’m going to try and learn how to make some clothes this year. Should be interesting! Anyway, you make a great model!